It’s official: After a protracted slump that had him questioning his own mental stamina ("Where was my mind wandering?”), Roger Federer has finally reclaimed his place in Novak Djokovic’s head. Friday's four-set semifinal victory wasn’t exactly an extraordinary display of tennis wizardry, although there were flashes of drama, like the nail-biting up-for-grabs third set, all those winners touching just a sliver of the line on challenges and replays, plus Federer’s ability to dominate points off his second serve despite Djoko's masterful return game. But they were only subtle elements in the larger third act of The Great Federer. It’s been more than a year of suffering for Federer fans, who have watched their idol squander break points, breaks, set leads, two set leads, and match points to a player some jokingly refer to as “Satan.” In their last seven encounters, Federer has only been able to beat the younger Djokovic once. This season, Federer has been playing some of his best tennis in years; still, he couldn’t seem to find a way to edge Djokovic out, losing to him on clay in the semifinals in Rome and then again, in perhaps his most disappointing performance, in the semifinals at this year’s French Open. Today, Federer walked on Centre Court with all the conditions in his favor. The roof was closed, guaranteeing none of the windy gusts to disturb his service toss and which had caused him to shank so many framers in Roland Garros. After losing the first set, Djokovic appeared to figure out Federer’s serve and seemed for a while to be in full control of the match. But in the big points, Federer was able to hang in there, which is itself an art form within the mental hell tennis can become. Ask Djokovic, who found himself gazing into the strings of his racket fruitlessly looking for answers. Looking ahead to Sunday’s final, despite the win, it was troubling to see how Federer struggled to hit the ball cleanly. His ridiculously small 90-inch racket head is partly to blame; it seemed to take him the better part of three sets and the feeling of finally taking a sizable lead before he was able to hit his ground strokes with any authority. Federer has also been gambling with blitzing the net and resucitating his serve and volley game, but it’s hardly seemed to pay off at Wimbledon. While his presence at net might create some pressure on his opponents, it seems like he’s getting passed and passed and passed. But Federer can breathe easy, if only for a moment, after such a dominant victory over Djokovic. As he told me earlier this season in Madrid, there is a critical factor at play. 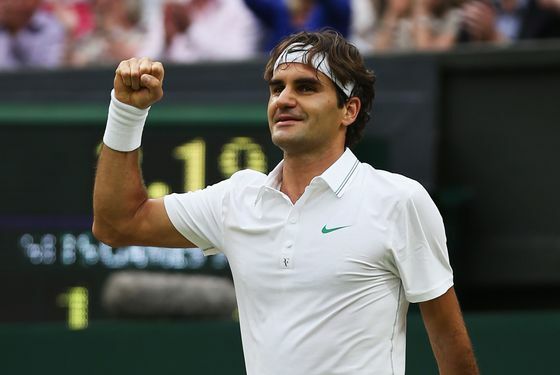 Can Roger Federer Reclaim His #1 Ranking?